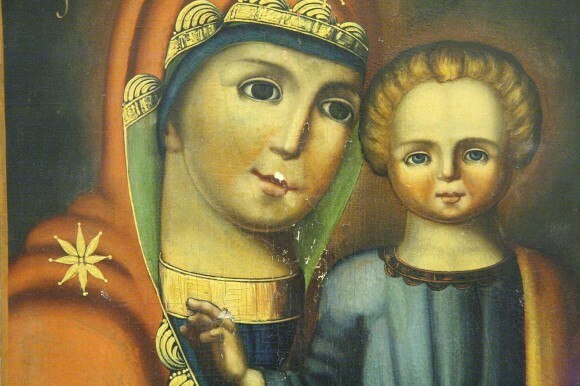 Pravmir.com has an article up featuring an ongoing exhibit of Russian “folk icons”. I have included a few images below, but the article should be read in its entirety. An icon corner from a Russian village. A few things come to mind when looking at these folk icons. As the author points out, these icons have a certain “warm-heartedness” about them, and this is a unitive factor among the vastly disparate styles and permutations presented in the exhibit. The author notes the similarity between this warm-heartedness, in Russian dushevnost, to the unitive factor among “proper” or “canonical” icons – their spirituality, or dukhovnost. Their warmth and innocence make the folk icons far more inviting and conversant than the cold and formulaic printed icons so abundant in the West. There is clearly much more to an icon than its adherence to the canons. Sure, a copy of a canonical icon follows the structural rules of form, line, color, and content. But it does not invite the viewer to meet the saint. The image is flattened, literally and figuratively, and the meeting of time and eternity is made difficult and distant, if not impossible. 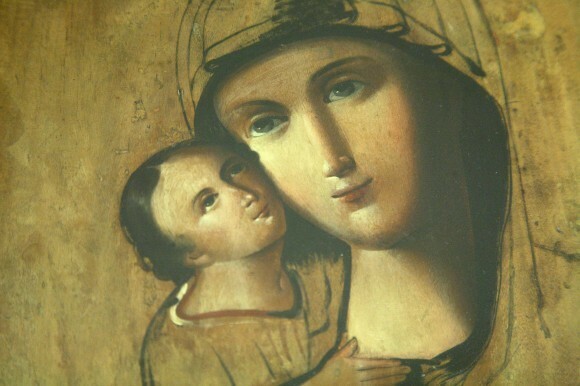 I am not suggesting that the guidelines of formal iconography are expendable, but rather that there is great value in the pious care an icon painter affords his work, folk or otherwise. Despite their deviation from the classical and canonical iconographic standards, “it goes without saying that folk iconographers … felt their responsibility before God for their work and strove towards piety,” according to the author. 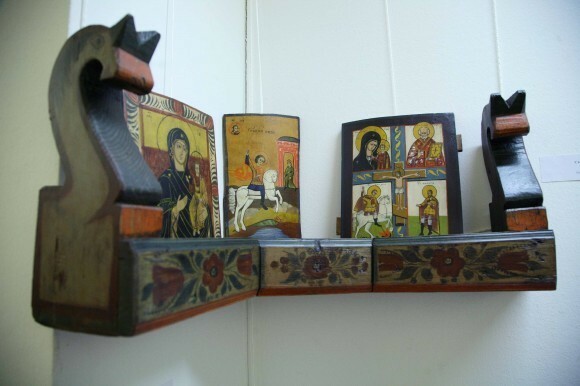 Were this exhibit to be seen by an American Orthodox Christian, would the contents be seen as folk art or icons? To begrudgingly use unfair terms and stereotypes, converts seem less patient with deviation from formal iconography, and embrace printed reproductions in lieu of expensive hand-painted masterworks. Cradle Orthodox seem to appreciate a wider spectrum of iconographic forms which present more cultural nuance and flavor, but often allowing uncanonical imagery and compositions, like the so-called “New Testament Trinity”. Perhaps we ought to take the best from both sides; preferring hand-painted icons over printed, despite a lack of refinement when compared to the work of masters, so long as they stay within the bounds of canonical content. Given time and careful guidance, the naivete of the inexperienced iconographer will fade, and develop into an indigenous iconographic style. I’m a convert, and I find these “folk icons” to be wonderful expressions of the truth that has been given us, and is taught always, everywhere, by all. The writers of these icons made this truth their own. And these icons testify to the evangelism offered within the context of their time and place: they gave to their homes and to their community The Gospel. Now it comes to us. I look forward to a time when a more indigenous Orthodoxy in America is given its “nihil obstat and imprimatur”/Good Housekeeping Seal of Approval and more icon writers, hymnographers, liturgists, embroiderers, weavers, sculptors, artisans of all types are embraced and encouraged within the rubrics of canonicity. I look forward to a flowering of Orthodox arts here in America that is informed by the past but not bound to it. One of our parishioners is a prisoner in the state prison here. He is writing icons there using, as best he can, those means open to him: books, and other icons allowed him by the state and the teaching our Priest can offer him during his visits. His icons are available at our Parish bookstore. His ability has grown in the years I’ve been here, but it’s obvious what his limitations are. He will never be able to attend any workshops, given his sentence, nor will a workshop be coming to him…save God grants him a miracle. 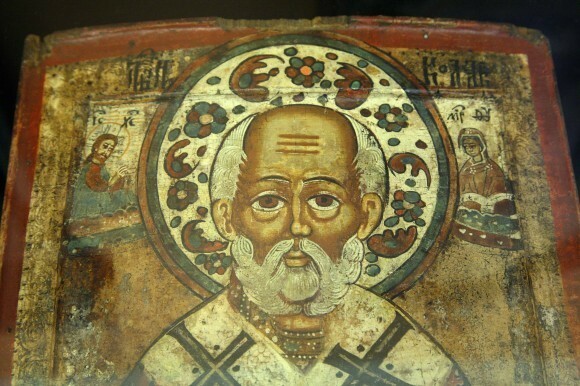 But his icons are lovely and of the same “dushevnost” as those depicted here. Perhaps, one of the reasons converts buy the printed icons that are so readily available is because more ethnic Orthodox push the rubric of “NEED ICON CORNER” so hard. It’s second only to THOU SHALT FAST! I know when I converted, this was a real pressure from the jurisdiction I first encountered. The idea that there was something, well, lacking between printed and painted icons wasn’t an issue. It was a requirement for me to set up my icon corner immediately, if not sooner. And if I couldn’t afford the printed icons, I could download images from my computer, print them, and tack them up on my wall. I guess copyrights are a non-issue as well? In any case, I’ve managed to buy two hand-painted icons and I am slowly purchasing others… And, golly! they make such nice baptismal/chrismation gifts!